Selects ripped DVDs on your hard drive for playing (includes TV edition). Is there a better alternative to Matinee? Is Matinee really the best app in Video category? Will Matinee work good on macOS 10.13.4? 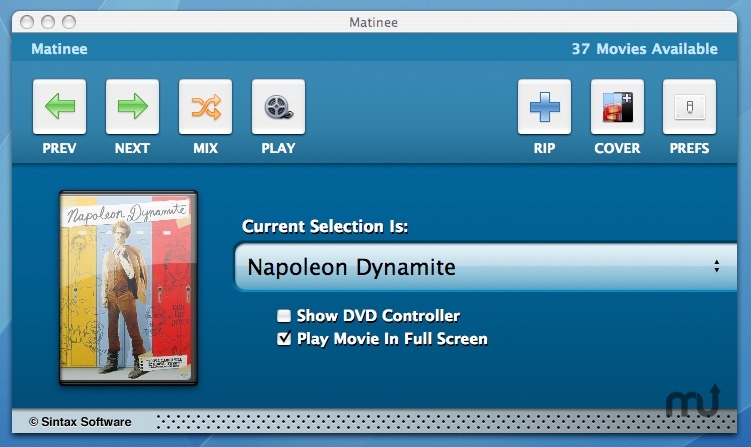 Matinee is a 1-Click movie launcher for Mac users who rip DVD's to their hard drive. This application does not rip the DVD but provides a clean interface for accessing all the titles you have available to watch. Matinee supports up to five configurable VIDEO_TS locations and pulls all your movie titles into one organized list automatically for you. You can even add the movies box art to each entry in your list for added visual appeal. Mac OS X 10.4 or later, Apple DVD Player, DVD drive. Matinee needs a rating. Be the first to rate this app and get the discussion started!